Donald Virgil Bluth (/bluːθ/; born September 13, 1937) is an American animator, film director, producer, writer, production designer, video game designer, and animation instructor. He is known for directing animated films, including The Secret of NIMH (1982), An American Tail (1986), The Land Before Time (1988), All Dogs Go to Heaven (1989), and Anastasia (1997), and for his involvement in the LaserDisc game Dragon's Lair (1983). He is also known for competing with former employer Walt Disney Productions during the years leading up to the films that would make up the Disney Renaissance. He is the older brother of illustrator Toby Bluth. Bluth was born in El Paso, Texas, the son of Emaline (née Pratt) and Virgil Ronceal Bluth. His great-grandfather was Helaman Pratt, an early leader in The Church of Jesus Christ of Latter-day Saints (LDS Church). He is of Swedish, English, Irish, Scottish, and German descent. As a child in El Paso, he rode his horse to the town movie theater to watch Disney films; Bluth said later, "then I'd go home and copy every Disney comic book I could find". At the age of six, his family moved to Payson, Utah where he lived on a family farm. Bluth has stated that he and his siblings do not have much communication with each other as adults. In 1954, his family moved to Santa Monica, California, where he attended part of his final year of high school before returning to Utah and graduating from Springville High School. Bluth attended Brigham Young University in Utah for one year and after got a job at Walt Disney Productions. He started in 1955 as an assistant to John Lounsbery for Sleeping Beauty. In 1957 Bluth left Disney only two years after being hired. Afterward, Bluth spent two and a half years in Argentina on a mission for the LDS Church. He returned to the United States where he opened the Bluth Brothers Theater with his younger brother Fred, though he occasionally worked for Disney. Bluth returned to college and got a degree in English Literature from Brigham Young University. Bluth returned to the animation business and joined Filmation in 1967 working on layouts for The Archies and other projects. He returned full-time to Disney in 1971 where he worked on Robin Hood, Winnie the Pooh and Tigger Too, The Rescuers and directing animation on Pete's Dragon. His last involvement with Disney was the 1978 short The Small One. Then he made and produced his first short film, Banjo the Woodpile Cat, which takes place in his hometown Payson, Utah during the 1940s as Banjo travels to Salt Lake City to find the urban world. On his 42nd birthday in 1979, Bluth, Gary Goldman, John Pomeroy, and 9 fellow Disney animators, set out to start his own animation studio, Don Bluth Productions. He drew a few (uncredited) scenes for The Fox and the Hound but left early in production. Bluth was disheartened with the way the Disney company was run. He wanted to revive the classical animation style of the studio's early classics. To this end, his studio, Don Bluth Productions, demonstrated its ability in its first production, a short film titled Banjo the Woodpile Cat, and this led to work on an animated segment of the live-action film Xanadu (1980). The studio's first feature-length film was The Secret of NIMH (1982), an adaptation of Mrs. Frisby and the Rats of NIMH, the 1972 Newbery Medal winner. Bluth employed 160 animators during the production and agreed to the first profit sharing contract in the animation industry. Though only a moderate success in the box office, the movie received critical acclaim. Later, with the home video release and cable showings, it became a cult classic. Nevertheless, due to its modest box office take, and an industry-wide animation strike, Don Bluth Productions filed for bankruptcy. In 1983, he, Rick Dyer, Goldman and Pomeroy started the Bluth Group and created the groundbreaking arcade game Dragon's Lair, which let the player control an animated-cartoon character on screen (whose adventures were played off a LaserDisc). This was followed in 1984 by Space Ace, a science-fiction game based on the same technology, but which gave the player a choice of different routes to take through the story. Bluth not only created the animation for Space Ace, but he also supplied the voice of the villain, Borf. Work on a Dragon's Lair sequel was underway when the video arcade business crashed. Bluth's studio was left without a source of income and the Bluth Group filed for bankruptcy on March 1, 1985. A sequel called Dragon's Lair II: Time Warp was made in 1991, but it was rarely seen in arcades. In 1985, Bluth, Pomeroy, and Goldman established, with businessman Morris Sullivan, the Sullivan Bluth Studios. It initially operated from an animation facility in Van Nuys, California, but later moved to Dublin, Ireland, to take advantage of government investment and incentives. Sullivan Bluth Studios also helped boost animation as an industry within Ireland. Bluth and his colleagues taught an animation course at Ballyfermot Senior College. Teaming up with producer Steven Spielberg, Bluth's next project was An American Tail (1986), which at the time of its release became the highest grossing non-Disney animated film of all time, grossing $45 million in the United States and over $84 million worldwide. The second Spielberg-Bluth collaboration The Land Before Time (1988) did even better in theaters and both found a successful life on home video. The main character in An American Tail (Fievel Mouskewitz) became the mascot for Amblimation while The Land Before Time was followed by thirteen direct-to-video sequels. Bluth broke with Spielberg before his next film, All Dogs Go to Heaven (1989). (Bluth was not involved with the Spielberg-produced An American Tail: Fievel Goes West, released in 1991, nor with any of the numerous subsequent sequels to his other films.) Although All Dogs Go To Heaven only had moderate theatrical success, it was highly successful in its release to home video. Like The Land Before Time, The Secret of NIMH, and An American Tail, All Dogs Go to Heaven was followed by related projects, none of which involved Bluth and his studio. He also directed films, such as Rock-a-Doodle (1992), Thumbelina (1994), A Troll in Central Park (1994) and The Pebble and the Penguin (1995), which were critical and box office failures. Bluth scored a hit with Anastasia (1997), produced at Fox Animation Studios in Phoenix, Arizona, which grossed nearly US $140 million worldwide. In his positive review of the movie, critic Roger Ebert observed that its creators "consciously include[d] the three key ingredients in the big Disney hits: action, romance, and music." Anastasia's success established 20th Century Fox as a Disney competitor. Despite the success of Anastasia, Bluth resumed his string of box-office failures with the post-apocalyptic space adventure Titan A.E. (2000), which made less than $37 million worldwide despite an estimated $75 million budget. In 2000, 20th Century Fox Studios shut down the Fox Animation Studio facility in Phoenix, making Titan A.E. the last traditionally animated film released by 20th Century Fox in theaters until the release of 2007's The Simpsons Movie. On October 26, 2015, Bluth and Goldman started a Kickstarter campaign in hopes of resurrecting hand-drawn animation by creating an animated feature-length film of Dragon's Lair. The Kickstarter funding was canceled when not enough funds were made close to the deadline, but an Indiegogo page for the project was created in its place. On December 14, 2015, the Indiegogo campaign reached its goal of $250,000, 14 days after the campaign launched, and got more than twice the budget on January 16, 2016. As of June 2016[update], the campaign had raised $604,108 and as of February 2018[update] the total exceeded $728,000. An animated short film based on the Pied Piper of Hamelin story was in development, entering pre-production in the early 1970s. Art designs and works were created for the film, but ended up being abandoned for unknown reasons. Some of the artwork can be found online. In the early 1980s, Bluth Productions started production work on an animated feature film entitled East of the Sun and West of the Moon. Ultimately, the film was never made due to a loss of financial backing, even though the film was heavily into post-production at the time of its cancellation. They decided to make An American Tail as its 2nd animated film, starting production in December 1984 and released in November 1986. An animated film that Don Bluth started pre-production work with Steven Spielberg. The film would have been an outer space adventure movie. After acquiring the rights to The Beatles' songs in the mid-1980's, Michael Jackson approached Bluth with a movie idea called Strawberry Fields Forever. The film would have had animated Fantasia-style vignettes featuring Beatles songs, similar to Yellow Submarine. Not only did Don Bluth agree to it, he also planned on making it entirely in CGI. Had the movie been made, it would have predated the ground-breaking Toy Story by about eight years. From deep within production of the project, the premise became revamped so that characters from Beatles songs (like Mr. Mustard and the Walrus) would act as New York City gangsters. Among other reasons, the main reason why the project fell through was because the surviving Beatles members denied permission to use their images in the animated film. The only surviving part of the film was test footage of the "Beatles gangsters. Bluth was in production for an animated feature film that involves whales but more of a discovery experience through a whale's eye with a beautiful score and narration. 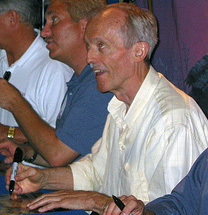 While scenes where made in 1991, the film's production was canceled due to problems with studios, resulting in Don Bluth working on other productions. Blitz Games planned a video game adaptation of Bluth's Titan A.E. to be released for the PlayStation and PC in Fall 2000 in North America, following the film's summer release. Development on both platforms had begun in March 1999 under the film's original title Planet Ice, and an early playable version was showcased at the 2000 Electronic Entertainment Expo in Los Angeles. In July 2000, a spokesman from the game's publisher Fox Interactive, announced that development on the title had been halted largely due to the film's poor box office performance which was "only one of many different factors" that led to its cancellation. A sequel to the 2003 game I-Ninja was planned, which had input from Bluth. Work on the sequel started soon after the first game's release, but its studio Argonaut Games had some economic problems and eventually closed down in October 2004. The few aspects remaining from I-Ninja 2's development are some concept drawings. Originally planned to have worked on in partnership with Namco around 2003. The project was scrapped due to financial problems on Namco's part leading to their merger with Bandai in 2007 and whatever development assets were left over was made into Pac Man World 3 with no involvement from Bluth. On March 4, 2015, Deadline Hollywood reported that MGM had re-acquired the film rights to produce a new film based on the original novel Mrs. Frisby and the Rats of NIMH. The film would have been produced by Bluth and the team of Daniel Bobker and Ehren Kruger, with screenplay by Ice Age series writer Michael Berg. It was planned as a CGI/live action hybrid "à la The Smurfs and Alvin and the Chipmunks", and would have been "an origin story in which an imperiled mouse protagonist befriends a comical crew of lab rats as they turn hyper-intelligent. They escape a secret laboratory and become the great minds of vermin civilization, forced to outwit the humans hot on their tails." The studio planned to turn the novel into a family franchise. Since then, there have been no further announcements. In the 1980s a film version of Dragon's Lair was planned, with Alan Dean Foster involved in shaping the story. The project fell apart due to low interest from other studios. On October 26, 2015, Bluth and Goldman started a Kickstarter campaign to create a teaser for an animated feature-length Dragon's Lair prequel film, their first feature film since Titan A.E. The Kickstarter funding was canceled when not enough funds were made close to the deadline, but an Indiegogo page for the project was created in its place. On December 14, 2015, the Indiegogo campaign reached its goal of $250,000 to produce a teaser, 14 days after the campaign launched, and got more than twice the budget on January 16, 2016. Bluth and Goldman have announced that the film will provide more backstory for Dirk and Daphne and that Daphne will show that she is not a "blonde airhead". Since then, there have been no further production news. In 2002, Bluth and video game company Ubisoft developed the video game Dragon's Lair 3D: Return to the Lair, an attempt to recreate the feel of the original Dragon's Lair LaserDisc game in a more interactive, three-dimensional environment. Reviews were mixed, with critics both praising and panning the controls and storyline. However, the visuals were noteworthy, using groundbreaking cel-shading techniques that lent the game a hand-animated feel. As of 2012[update], Don Bluth and Gary Goldman were seeking funding for a film version of Dragon's Lair. After apparently sitting in development for over a decade, the project raised over $570,000 via a successful crowdfunding campaign in January 2016. Bluth and Goldman continued to work in video games and were hired to create the in-game cinematics for Namco's I-Ninja, released in 2003. In 2004, Bluth did the animation for the music video "Mary", by the Scissor Sisters. The band contacted Bluth after having recalled fond memories of the sequence from Xanadu. In 2009, Bluth was asked to produce storyboards for, and to direct, the 30-minute Saudi Arabian festival film Gift of the Hoopoe. He ultimately had little say in the animation and content of the film and asked that he not be credited as the director or producer. Nonetheless, he was credited as the director, possibly to improve the film's sales by attaching his name. On February 3, 2011, it was announced that Bluth and his game development company Square One Studios were working with Warner Bros. Digital Distribution to develop a modern reinterpretation of the 1983 arcade classic Tapper, titled Tapper World Tour. Bluth has authored a series of books for students of animation: 2004's The Art of Storyboard, and 2005's The Art of Animation Drawing. In early 2009, Bluth launched his website in which he focuses on animation education through video tutorials, short films, and live video seminars. In the 1990s, Bluth began hosting youth theater productions in the living room of his Scottsdale, Arizona home. As the popularity of these productions grew and adults expressed their wishes to become involved, Bluth formed an adult and youth theatre troupe called Don Bluth Front Row Theatre. The troupe's productions were presented in Bluth's home until 2012, when their administrative team leased a space off Shea Blvd in Scottsdale and converted it into a small theater. ^ Bendazzi, Giannalberto (October 2015). "A Cat in the Heavy Traffic". Animation: A World History: Volume II: The Birth of a Style - The Three Markets. CRC Press. ISBN 9781317519904. Among the directors of feature films, Don Bluth is noteworthy. Born in El Paso, Texas, on 13 September 1937, Bluth went to Disney in 1956 (...). ^ "Don Bluth". Mormons in Business. Archived from the original on 2011-01-15. Retrieved 2012-07-25. ^ William Addams Reitwiesner. "The Ancestors of Mitt Romney". Retrieved 2012-07-24. ^ Cardwell, Lynda (1984-02-18). "Laser disc arcade games could become wave of the future". The Gadsden Times. pp. A8. Retrieved 10 November 2013. ^ "Shut Up and Talk: Don Bluth and Gary Goldman". Channel Awesome. Retrieved 25 July 2016. ^ "About Don". Don Bluth Animation. Archived from the original on 2012-08-26. Retrieved 2012-07-25. ^ a b c Heintjes, Tom (May 1985). "Newswatch: Bluth animation firm goes bankrupt". The Comics Journal No. 98. p. 19. Retrieved 2012-07-30. ^ a b Cawley, John. "Don Bluth Biography". The Animated Films of Don Bluth. Cataroo.com. Retrieved 2012-07-25. ^ Cawley, John. "The Secret of N.I.M.H." The Animated Films of Don Bluth. Cataroo.com. Retrieved 2012-07-30. The film developed a cult following which only increased with easy access via video and cable showings. ^ Beck, Jerry (June 1996). "Don Bluth Goes Independent". Animation World Magazine. Retrieved 10 August 2012. That failure [of Secret of NIMH] caused Aurora to back out of producing Bluth's next film, East of the Sun, West of the Moon. ^ Cawley, John. "Space Ace". The Animated Films of Don Bluth. Cataroo.com. Retrieved 2012-07-25. ^ "Dragon's Lair II". The International Arcade Museum. Retrieved 10 August 2012. This game ranks a 24 on a scale out of 100 (100 = most often seen, 1=least common) in popularity based on census ownership records. ^ "Estudios Irlandeses – Drawing Conclusions: Irish Animation and National Cinema". www.estudiosirlandeses.org (in Spanish). Retrieved 2017-02-12. ^ Melena Ryzik (2010-03-03). "An Animated Irish Invasion". The New York Times. Retrieved 2010-11-19. ^ a b Cawley, John. "An American Tail". The Animated Films of Don Bluth. Cataroo.com. Retrieved 2012-07-30. ^ Cawley, John. "The Land Before Time". The Animated Films of Don Bluth. Cataroo.com. Retrieved 2012-07-31. ^ Cawley, John. "All Dogs Go To Heaven". The Animated Films of Don Bluth. Cataroo.com. Archived from the original on 2014-01-03. Retrieved 2012-07-31. ^ "Anastasia (1997)". Box Office Mojo. Retrieved 2012-07-31. ^ Ebert, Roger (November 21, 1997). "Anastasia". Chicago Sun-Times. Retrieved 2012-07-31. ^ "Titan A.E. (2000)". Box Office Mojo. Retrieved 2012-07-31. ^ "20th Century Fox Feature Films (Fox Animation Studios) Animated Theatrical Cartoons (1977-)". The Big Cartoon Database. Retrieved 2012-07-30. ^ "Dragon's Lair: The Movie (Canceled)". Kickstarter. ^ "Dragon's Lair Returns". Indiegogo. ^ "Sections of Piper Short". YouTube. ^ John Grant, p 35, Masters of Animation, Special Effects Are Revolutionizing Film"
^ Jerry Beck, "Don Bluth Goes Independent"
^ a b Douglas C., Perry (June 22, 2000). "Titan A.E." IGN. Retrieved December 9, 2015. ^ "I-Ninja 2 Cancelled". Unseen64. Retrieved November 6, 2018. ^ a b Fleming Jr., Michael (March 4, 2015). "MGM Options 'Mrs. Frisby & The Rats Of Nimh', Sets 'Ice Age's Michael Berg To Hatch Family Franchise". Deadline Hollywood. Retrieved October 19, 2015. ^ Nicholson, Max (March 4, 2015). "Live-Action/CG Rats of NIMH Movie in the Works". IGN. Retrieved October 19, 2015. ^ "Dragon's Lair: The Movie (Canceled) by Don Bluth & Gary Goldman". Kickstarter. October 26, 2015. Retrieved September 13, 2016. ^ a b "Dragons Lair Returns". Indiegogo. Retrieved September 13, 2016. ^ "Dragon's Lair creators turn to Kickstarter to raise money for Dragon's Lair: The Movie". Polygon. Retrieved September 13, 2016. ^ "Dragon's Lair Movie Won't Depict "Sexualized" Version of Princess Daphne". GameSpot. Retrieved September 13, 2016. ^ "Dragon's Lair 3D: Return to the Lair". Metacritic. Retrieved 2012-07-25. ^ Arrant, Chris (2012-04-05). "EXCLUSIVE: Don Bluth Talks About His Return To "Dragon's Lair"". Cartoon Brew. Archived from the original on 2012-05-09. Retrieved 2012-07-25. ^ Kelly, Kevin (2007-05-01). "Don Bluth trying to make Dragon's Lair movie". Joystiq. Retrieved 2012-07-25. ^ Weinberg, Scott (2007-04-29). "Don Bluth Still Wants to Make a 'Dragon's Lair' Movie". Moviefone. Retrieved 2012-07-25. ^ "Dragons Lair Returns | Indiegogo". Retrieved 2016-04-03. ^ Paolo (2004-10-22). "Don Bluth animates Scissor Sisters video". Animated Views. Retrieved 2012-07-25. ^ "Gift of the Hoopoe -Recent film of Don Bluth?". Archived from the original on 2012-03-10. Retrieved 2012-07-25. ^ Trimble, Lynn (7 July 2016). "Don Bluth Front Row Theatre in Scottsdale Needs $50,000 to Stay Open".